Gyakuten Kenji 2 has been announced! Here is everything we know about the game, as the information comes in. Eshiro says they've been working on GK2 since September of last year, as a result of a great fan reception to the first GK. The release date is currently "Spring 2011." In addition to the Logic Mode they're implementing a "Chess" system, which allows Edgeworth to uncover information witnesses are trying to keep hidden. Exactly how that works we don't know yet, but the creators claim that even though it's based on a chess motif, it will be simple and easy to grasp. Otherwise, the same gameplay is mostly going to return (investigations, logic mode, etc). The tiny sprites have been upgraded. Because the last game focused more on Kay and her drama, the creators claim that GK2 will focus more on Edgeworth, and specifically his feelings of conflict. Eshiro says we're going to see "a more human side of Edgeworth that hasn't been shown before." He also says they're focusing on "present Edgeworth" so we may not see a reappearance of Bratworth this time. We don't know yet when the game takes place. Case 1 takes place at Gourd Lake. The creators say they wanted to start with a large, important first case that feels more like a last case. We're going to see another large collection of GS era returning characters as well. -Outeikun, President of Zheng Fa. Could be case 1 victim? In his screenshot he's saying something about "Our fight is not over, this is war!" and supposedly it's followed by a gun firing. -Mikiko Hayami, the beartrap girl. This thread is not for speculation, so please only comment if you have some new information to share. Spoiler: it's a background, spoilers perhaps? The plane has a phoenix. Could this be a reference? OH GOD, YOU ARE RIGHT. -Some dude who looks like a lion...!? ...Because I felt the need to advertise my fanfic with a self-drawn, animated banner. Yes, I'm obsessed, why do you ask? I heard TGS is on September 16th. Could the release of the game be close? ^ It's not being released but it is playable. Considering it's been development for about a year now it's not surprising. IMO I think the phoenix may have something to do with Zheng Fa. Naruhodou Ryuuichi (Phoenix's Japanese name) has nothing to do with a phoenix. 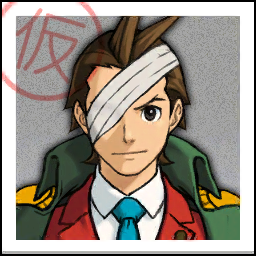 the case he got his american name first from was called "Reborn Turnabout" in the japanese version (and simmilarly "Rise from the Ashes" in the american), so they might just be thinking that Japanese Fans would also see how this refers to "Naruhodo-kun". The phoenix is clearly the symbol on the Zheng Fa flag, as can be seen on the Capcom site. Apparently we have another diplomatic situation on our hands. Wheee! P.S. Sorry, am quite excited. Hello everyone and forgive the URL instead of the image, for some reason hotlinking won't work. Well, Holmesworthy does, at least. Looks like Shelly de Killer in the first scan. 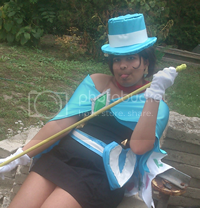 Some other character is pictured as well, but we don't know who it is yet. That is definitely Shelly. You can see him more clearly on the official website. What's he got in his hand? Is that a vaguely penguin-y ice cream cone? Also, is that a giant Steel Samurai balloon I espy? Laaaaarryyyy! I can't believe no one have still point out some facts of the game writed in Gyakuten Kenji 2 site. I even had to register forum just to point some facts which still haven't noted. 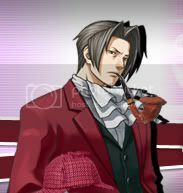 - In character description of Edgeworth, it says that he is candidated as attorney general. Also, there is written something about him being responsible for major incident. Nothing new revealed in Kay's and Gumshoe's profiles. - There is one other thing which bother me a little. In page about examining, there is something about Edgeworth investigating crime scenes with partner and 怪しい場所, which I have no idea what that is. In direct translation it's called Old Place, but it's not japanese name for Little Thief, which is something like nusumi-chan. Could it be new item, or have I just somehow misleaded? Nothing else I didn't occur from GK2 site. There was own page about chess system, but it just basically said "Expect to see the story" and nothing about how it does work. Also the story page summarize that there was going to be some kind speech in Gourd Lake, which might be already obvious. Nothing specific details from case. EDIT: Well, I've been trying to read the site through Japanese-to-Korean Google Translate. I didn't live in Korea long enough to know what they call various legal jobs, but yeah, Edgeworth is definitely being at least nominated for some sort of really high position (though whether it's an "attorney general" or merely "chief prosecutor" or the position of that guy Redd White blackmailed, I can only guess at). Last edited by capefeather on Sat Sep 11, 2010 4:37 pm, edited 2 times in total. Edgeworth is running to become the government's main legal advisor!? If that's true, THAT'S EFFIN' CRAZY! Ayup. Our Edgy is awesome like that. Besides, that could also explain why Phoenix was chosen to implement the jurist system. I am doing my sincere best right now to not get caught up in the hype and speculation that dampened my experience with T&T, but the current evidence too convincing. Argh! The Prosecutor office's genius prosecutor. Before, he thought a prosecutor's job was just to get guilty verdicts, but after a certain incident, he's realized that being a prosecutor means finding the truth. Also, it's "ayashii basho" which just means "suspicious places." [quote=Edgeworth's Profile on the site]The Prosecutor office's genius prosecutor. Before, he thought a prosecutor's job was just to get guilty verdicts, but after a certain incident, he's realized that being a prosecutor means finding the truth. Aaah, okay. This makes a lot more sense. Thank you Croik. 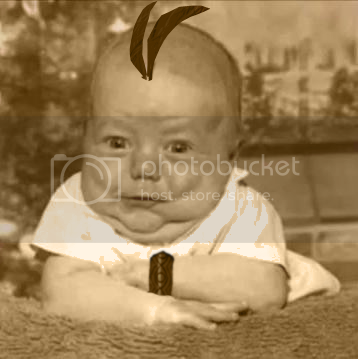 Also: conflicted Edgey is ... *ahem* is very interesting indeed. BTW would it be okay if I were to post translations of the profiles? You'd better be nice to Mr. Judge! What's he got in his hand? Is that a vaguely penguin-y ice cream cone? Look at the trailer! When he's nervous the ice cream... smokes inside! Like... is this a BOMB!? You might be right! Look at new Lake. On right side of picture are stands with... Stell Samurai gifts! Who will be selling this stuff? Ms. Oldbag and Larry! Investigate more the picture. As you can see... there's a lot of cameras! So my point is... there was a lot of journalist and reportes! And who wants show hole world her big scoop! Oh No! It's Snack Time!! I've got some pretty sweet information. From what I've heard, its just like a cross examination but the whole thing is based on testimony instead. I didn't notice that this information was already posted untill after I did. Well this is the information I got about how it all begins. Dunno if you can call it a spoiler because it's just basically the product description from play-asia. "One minute, an important politician was giving a speech that was broadcast live through the televisions, and another moment later, bang, all hell broke loose. Hats, and coats flew everywhere and people cowered on the ground. Someone was trying to shoot the politician and Edgeworth the prosecutor is going to find out who. Head to this grand stage with your lovely sidekick and interrogate witnesses. Rearrange the information you gathered and discover glitches with your witnesses' testimonies. Shout out at them during the logic matches when you find suspicious points and force the truth out of these slithery people." I have something to contribute to Yumihiko's character page. When he speaks to Mikagami, he always (at least so far, and I'm halfway through Case 5) refers to her as simply "Mikagami." Known in Japanese as yobisute, referring to someone without an honorific (Franziska does this too) is extremely impolite unless one is a family member or cherished friend/loved one. This is made even more atrocious by Yumihiko's inexperience as a prosecutor. Edgeworth always refers to Mikumo as "Mikumo-kun", showing his respect for her. It's worse than that, Nearavex. Yumihiko refers to Mikagami by her family name, which is considerably more condescending and rude than referring to her by her first name (or both names, as in the case of Franziska).